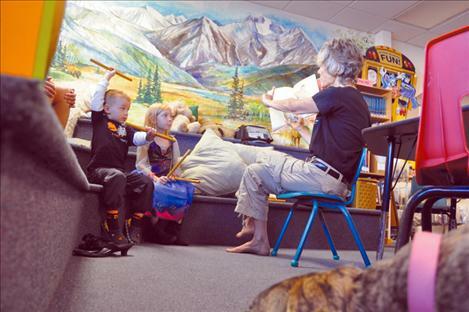 Liam Gingras and Aeryka Hunold enjoy a story read by Andrea Dunn while Library Lion Sadee looks on. 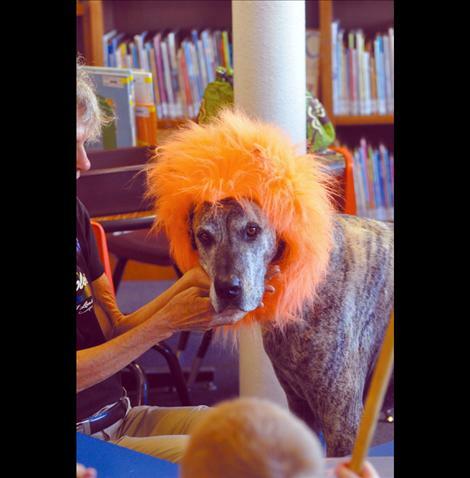 Library Lion Sadee gives kisses to her owner Andrea Dunn during story time at Ronan Library. RONAN — Sadee is much too quiet to roar. She’s more content to sun in a bit of light passing through a window or snuggle as a child combs their fingers through her neon orange mane. 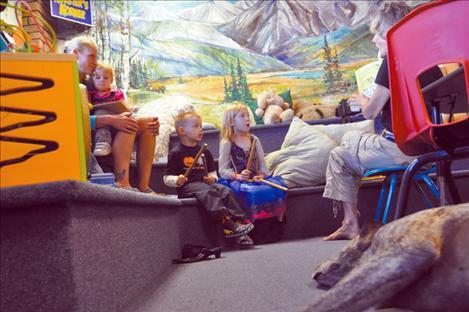 The 5-year-old Great Dane has become the mascot of story time at Ronan library. 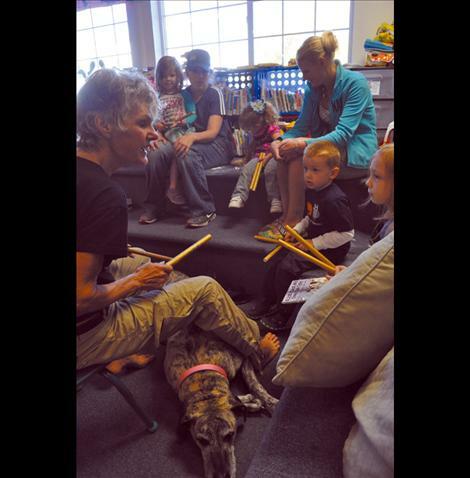 Dunn and Sadee give a story time performance at Ronan Library every Thursday at 10:30 a.m. Dunn said its a task she could have scarce imagined Sadee undertaking three years ago, when she and her husband adopted the dog. Sadee had immense fear of traveling and anxiety, though the pup harbored an intense intuition about people’s emotions, Dunn said. Eventually Sadee calmed down and Dunn found the dog was a good sport when it came to wearing a cap that looks like a lion’s mane. 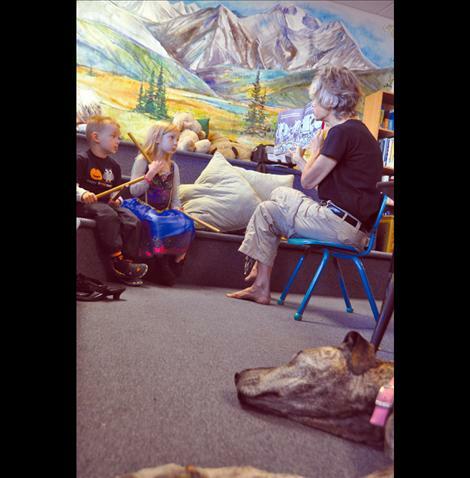 Dunn began bringing Sadee to story hour. 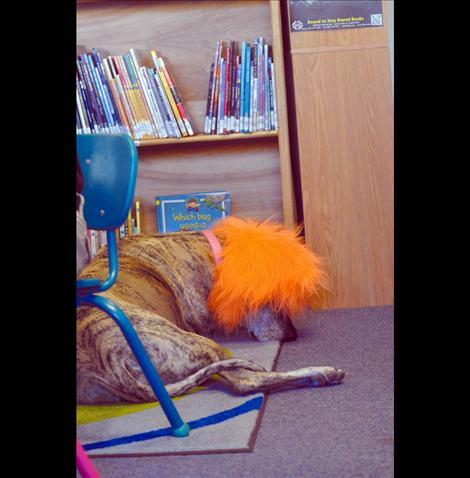 People loved the dog, Librarian Michelle Fenger said. 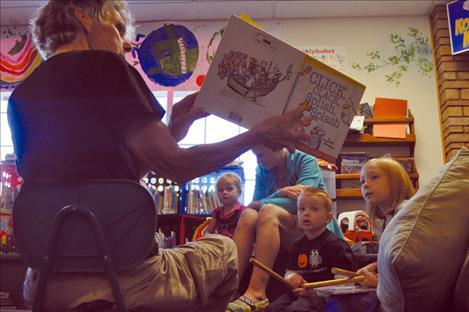 People loved story hour too, though crowds have thinned as Dunn’s audience moved on to elementary school. Last week, four children enjoyed a “Get in the Rhythm” presentation where the book Dunn read them revolved around sound and drumsticks. This week Dunn plans to make drums with the children. Four-year-old Liam Gingras was excited for the next story time as he searched for snake books because he thought the lines he decorated his drumsticks with looked like the serpents. He and sister Aeryka Hunold, 6, are regular attendees, grandmother Lorelda Gingras said. Aerkya wore her Princess Elsa costume to the event. “They look forward to it,” Gingras said. Tifanni Watkins attended her first Ronan Library story time last week with three-year-old daughter Gabriella. The duo liked having mascot Sadee around. 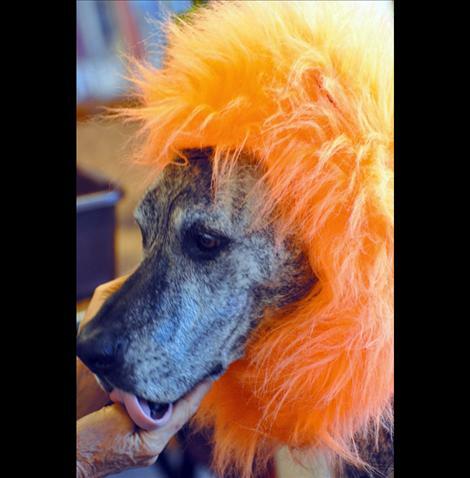 “She’s the coolest dog,” Watkins said. Dunn said she and Sadee would love to see more people come to story time. Due to the recent low attendance, Dunn says she’s open to suggestion as to whether a different time slot would be preferable. Contact the Ronan Library at (406) 676-3682.